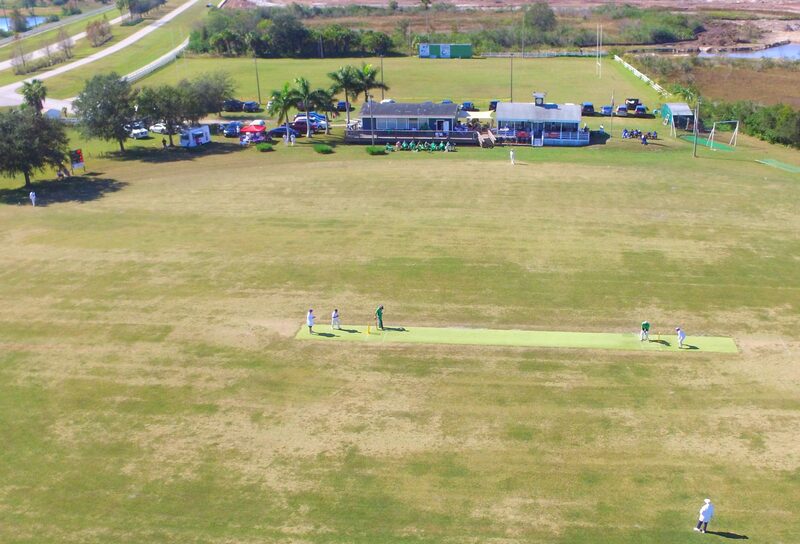 The batting surface at Sarasota International Cricket Club was getting worn out and it was high time to get it replaced. A replacement carpet was ordered from a company in Atlanta and arrived in due time. On a sunny morning in mid March SICC volunteers sprung to action to get the new surface installed. First order of business was to tear out the old carpet. Once removed the old surface had to be pulled of the field. Luckily that that could be done with our little tractor. The underlying matting was found to be in very good condition. However, the old stump boxes were rather out-off-shape and new ones had to be put in place. Once that was done the positions of the boxes were marked and the new carpet was unrolled. After some pulling, measuring and double-checking the carpet was nailed down on one end and the “carpet stretcher” was attached to the other end and put into action. Now it was time for the nailing crews to nail down the new surface along all sides. The last task of the day was to cut the openings for the stump boxes and to fill the boxes with clay and some water. Richard came back a few days later and painted the new markings. Now the new pitch was ready for the first game. Thanks to all the volunteers who took out time out of their busy weekend and help to install the new surface. Needless to say, a new carpet such as this is a significant expense for the club. Several members and friends have kindly helped with donations. If you would like to help, you can do so by clicking on the Donate button. Donations no matter how small are much appreciated.